CARPE DIEM HAIKU KAI: Carpe Diem # 503, Basho (1) "departing autumn"
Carpe Diem # 503, Basho (1) "departing autumn"
!! I am a bit early with posting this new episode, because of a busy day !! Last month (June) we had, in my opinion, a great mnnth.The modern summer kigo by Jane Reichhold were very inspirational, at least to me, but I think you all have enjoyed the prompts of une. We can look back at wonderfull Ghost Writer posts and the inspirational music by BrunuhVille. It was a great CDHK month and the upcoming month (July) will be exciting also. And that new month starts today. Thank you, or in Japanese: Arigato for your inspiration and participation. In this first episode of our new CDHK month I will look at a haiku from Basho's haibun 'The Narrow Road to the Far North'. This verse was the last haiku in his haibun. As I wrote above this is the last verse in Basho's 'Oku no Hosomichi' 'The Narrow Road to the Far North'. Because there are several word plays at work here, the Japanese maintain that there is no way for the poem to be rendered into another language. So here goes: hama (beach); hamaguri (a clam) however 'guri' is also (a chestnut) or (a pebble). And that is only the first line! 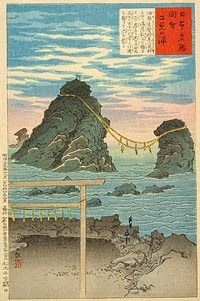 'Futami' (place name of the port where the famous Wedded Rocks (two large rocks considered to 'married' which are considered to be sacred) are such an attraction) is made up of the words 'futa' (lid, cover, shell) and 'mu' (body, meat, fruit, nut, berry, seed, substance, contents). The word 'wakare' can be either (to part or to split) or (to leave). Added to the last line (departing autumn) 'wakare' can mean either that it is autumn which is leaving or a person who is departing. 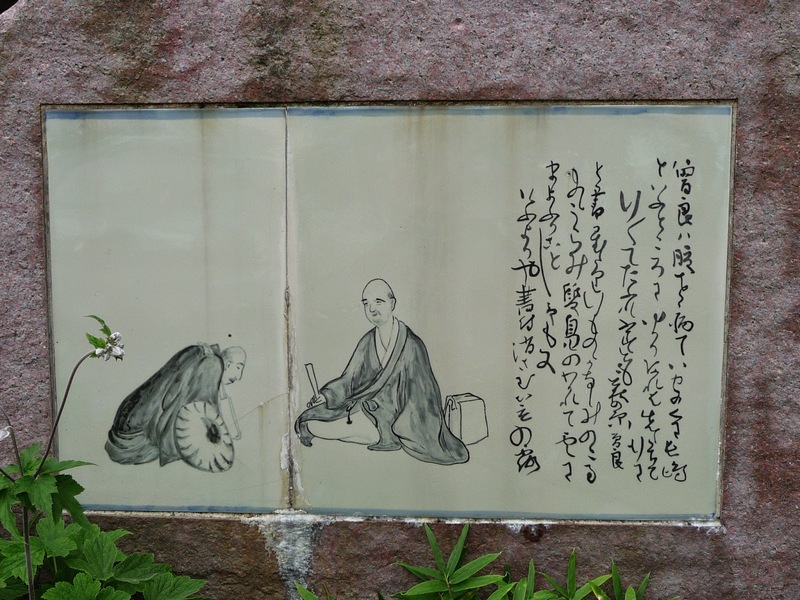 In Ogaki, Basho was met by many of his disciples, including Sora who rejoined him, for the end of the trip back to Tokyo. This verse, and the second one in 'Oku no Hosomichi' are considered the 'book-ends' of the work with partings of Spring and Autumn. Awesome! Isn't it! This haiku is a masterpiece worthy to enclose his haibun 'Narrow Road' as I read the previous part again. I love to write a haiku with the same words, but with the other meaning. That will be the challenge for this episode of Carpe Diem Haiku Kai and of course I have to try. No ... I must try. Well ... it wasn't easy, but I think I did well. Are these my masterpieces? Or in Basho's Spirit? I don't know. You, my dear readers, may tell me. Well ... this was our first episode of our new CDHK-month July and I hope you did like the read. This episode will be open for your submissions tonight at 7.00 PM (CET) and will remain open until July 3rd at noon (CET). I will try to post our next episode, our first Ghost Writer post of July, later on. For now ... have fun! Share your haiku inspired on the one by Basho with us all here at CDHK. 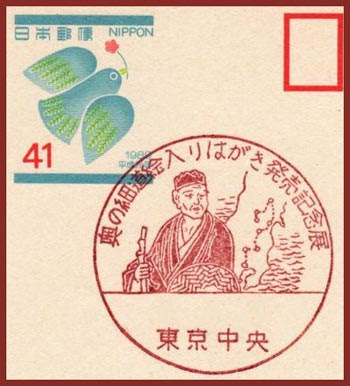 Try to write in the same sense, tone and spirit as Basho. Dear modest master! They are masterpieces of genre, in the way you teased Basho's thoughts, but I have seen some haiku from you that elevate the art form- even some you did not like that I thought were sublime! Thank you for this grand finale post of June, and again for the effort in making this such a memorable month. Once again, a fabulous prompt. I had no idea that a haiku could contain so many layers. Thanks for providing education along with your prompts. fine verse Kristjaan and excellent inspiration for us. Carpe Diem Special #97, BrunuhVille's "Riversong"
Carpe Diem Special #96, BrunuhVille's ²nd "Fable"